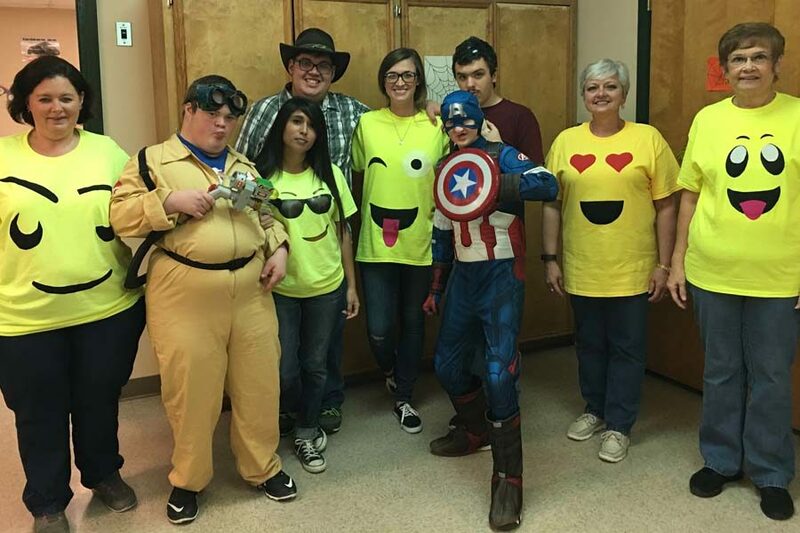 Team Force members show off their costumes. Meet in the Middle (MIM) is an organization that helps the student body get involved and acquainted with Life Skills students. MIM recently introduced a leadership team to the organization. The president is Baylea Perry, Vice President is Maccoy Head and the other officers include: Cody Janis, Brieann Wheat, Abbey Brown and Chrisleigh Longlois. Team Force teacher Terrie Parker has been the sponsor of MIM for almost six years and said it is a very beneficial organization to be a part of. Students with or without intellectual disabilities are encouraged to join. Sophomore Maccoy Head has been a part of MIM since his freshman year when he discovered the organization through a friend. Head said he decided to join because it was an opportunity to meet and help people he may otherwise never have met. “It makes me feel good by helping such an awesome group of people,” Head said. The leadership group helps plan the MIM trips and also assist the Team Force students on trips. Many times, MIM members find that the Team Force students are not the only ones who benefit from the organization. MIM has proven to be a perspective-changing club, as it has shown all students that no matter their differences, they can come together and learn so much as a team. “It showed me that the kids are amazing and normal just like you and I, and they want the same things as us, to hang out and make new friends,” Head said.